Line a couple baking sheets with parchment paper. Tape two sheets of blank printer paper together to form a large sheet about the size of your parchment. Trace 1-inch diameter circles onto the now large sheet of paper to form a stencil. Set aside for now. Mix the powdered sugar and ground almonds together. In a clean bowl, add your aged egg whites and salt. With an electric mixer, beat on low until frothy. Turn up the mixer to high and slowly add in the granulated sugar as you continue to mix till the whites are stiff peaks (when you lift up the mixer, there should literally be stiff, shiny peaks). Add in the black food coloring and mix a few more seconds. With a spatula, gently fold in the powdered sugar/nut mixture until incorporated. Place a plain piping tip in a piping bag and fill the bag with your macaron batter. Now take that circle stencil and place it under a piece of parchment and use as a guide as you pipe out your macarons. When done, slide out the paper, place it under your other parchment, and repeat. Pair all the macarons up by matching size. 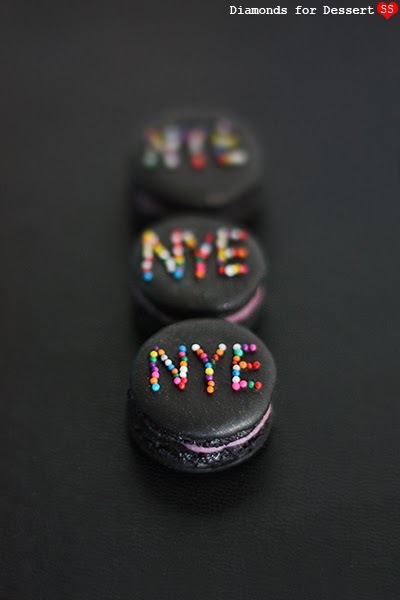 Decorate one of the macaron shells as indicated below. Fill a piping bag with blackberry filling (recipe below), pipe filling onto the non-decorated macaron shell in each pair, and sandwich the filling with the decorated matching macaron shell. Once done, refrigerate the macarons to let the flavors meld. Puree the blackberries in a blender and then press the puree through a sieve. Mix the puree with the powdered sugar in a small saucepan. Cook over medium heat until boils and thickens to the texture of ketchup. Melt the white chocolate in the microwave in a microwave-proof bowl. Heat the whipping cream in a small saucepan until simmering. Pour the heated cream over the white chocolate and mix. Add in the thickened blackberry puree and corn syrup. Mix until even. Cover the bowl with plastic wrap and let cool to room temperature. Move the mixture to the refrigerator to chill for a few hours. 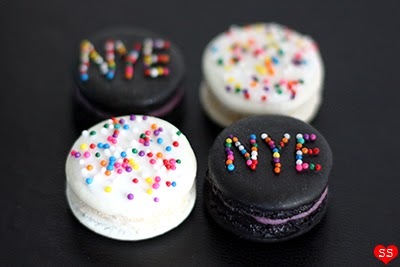 Color the sugar cookie icing with the black food coloring. 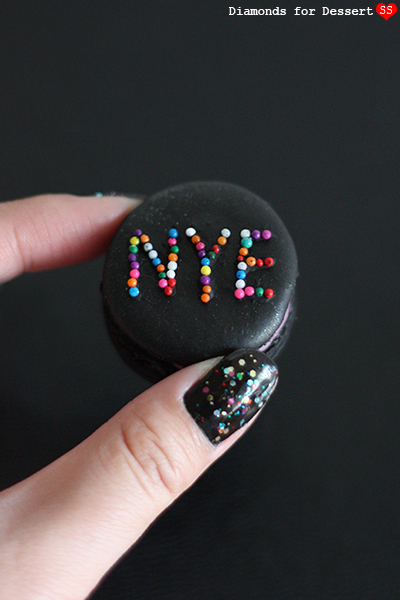 Use a toothpick to trace out "NYE" or "2014" on a macaron shell with the black icing. Sprinkle rainbow nonpareils over the icing. Shake off any excess sprinkles. Use a different toothpick to push off excess sprinkles and neaten up the sprinkle letters. 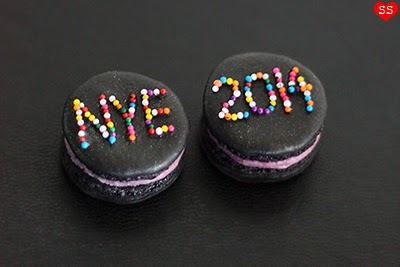 Repeat with the other macarons (you only need to decorate one shell in each matching pair of macaron shells). Let the icing dry before filling the macarons. If using the pearl dust, after the icing dries, use a clean paint brush to brush a small amount of pearl dust on each decorated macaron shell. 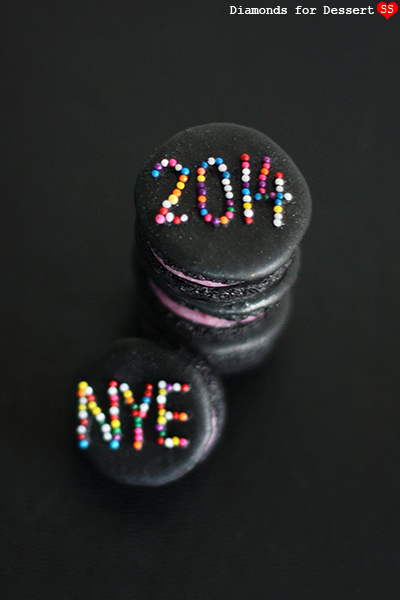 That's the way to spend New Years Eve, with macarons!! Your macarons look great. lol i thought you used tweezers to spell these out but your idea is much faster! Happy New Year Susan and here's to an even bigger year of delicious eats! Oh I love these! I will have to remember these for next year. Susan! wow you are macaron queen. I am making them for the first time for my hubby's bday so may need to read all your posts for pointers!